Don't quote me on this, but I'm pretty sure Edinburgh must be the festival capital of the world. There are 12 that take place there annually, with eight of them being held in August. Some, like the film and TV festivals take place over a matter of days, whilst others, like the Fringe and Edinburgh International Festival, last for three weeks. When planning to visit Edinburgh to work with the Edinburgh Festival and BBC Arts teams on their live coverage, the BBC Live team I'm part of were really keen to bring bite-size snippets of the festivals to the audience, from the Fringe to the Royal Military Tattoo. Combined with photos and stories from performers and punters, we'd set ourselves a bit of a challenge. And that is precisely how I found myself on a grey Wednesday evening stood within a circle of 250 pipers and drummers tuning up together whilst intimidating military band leaders wandered in and out of them, listening for bum notes. The sound, as they started to rehearse a number from the Tattoo, was like nothing I've ever experienced before. And yes, it was very loud, if you don't believe me, watch this. 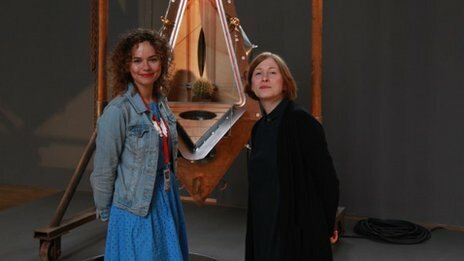 With the Art Festival, I leapt at the chance to have the festival's director Sorcha Carey take me on a tour of three of its diverse artworks, all positioned in different locations in the city. The Book Festival's Roland Gulliver also took me on a walk about some of the festival's stages, introducing me to their recent foray into late night events. And it took a bit of back and forth due to the restrictions around filming orchestras, but I was thrilled to interview the Edinburgh International Festival's Managing Director Joanna Baker before sneaking a peek at the Philharmonic in rehearsal. Being the largest arts festival in the world (not bad for something that started when a bunch of uninvited performers turned up at the Edinburgh International Arts Festival), showing the diversity of the Fringe may have been our trickiest challenge. I also nabbed the opportunity to grab some of the comedians the Fringe is dominated by each year to find out more about promoting, naming and performing their shows. Given that the 34% of the Fringe programme is now comedy, flyering is crucial, so I asked Chris Coltrane to teach me the tricks of the trade whilst hitting the streets to push his show, Left Wing Propaganda Machine. Interviews with sketch groups Minor Delays and Sad Faces and stand-up Lou Sanders followed, but I have to give special mention to Holly Burn, who is spending the whole Fringe as loveable Geordie lass Kirsty K (who's left Whitley Bay for the first time to perform at the festival), and yes - the interview was in character! 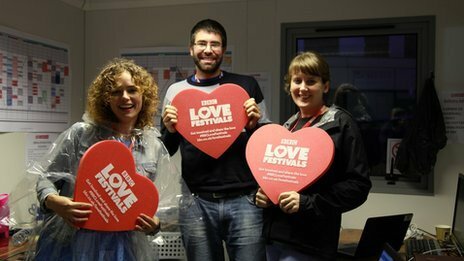 During our short stay at the festival, from Wednesday to Saturday, I felt like the team - Ollie Doward, Ruth Levis and myself - placed ourselves in the shoes of the performers. By eating, breathing (and not really sleeping in) Edinburgh. Running around, blogging, coping with adverse weather and unreliable internet - we were totally knackered by the end of it. Maybe next year I should make a video about surviving the full three weeks. Missed it? You can recap all the action from Saturday on the BBC Edinburgh Festivals website.